COME AUGUST AND SEPTEMBER, after the warm summer breezes have played through but before the first snaps of cool autumn air arrive, our state enacts a certain ritual—a rite of passage, really, one through which the year must pass before it can be transformed into winter and begin anew. Every state has this ritual, I suppose, but New Mexico does it like nobody else. Like all good rituals, this one brings us together, county by county, neighbor by neighbor. To participate, we must set aside our accustomed humility and instead strut our stuff a bit, put our special talents out for public admiration. We attune our awareness not to the grand functions of the world, but rather to those things that are so fundamental to our lives we often take them for granted. The ritual has winners, and the ritual has losers, and the difference between them could come down to something as simple as an errant cherry pit in a homemade pie. We call this ritual the county fair. I love county fairs. So much, in fact, that I’m on track to visit every one in New Mexico. (Twelve down and 19 to go—a couple of our 33 counties combine their efforts.) I love them because they take everything that’s conventional about our lives—the heirloom quilt on the bed, the pickles in the fridge, the flowers on the dining room table—and convincingly assert that these things are, truly, extraordinary. That’s the magic of fairs, a magic that epitomizes the heart of New Mexico: the everyday, exalted. I love fair parades with their police cars and fire trucks and homemade floats, one from the bank, one from the Methodist church, another with members of the local 4-H Club or the Future Farmers of America sitting on bales of hay in the back of a pickup truck, waving as they roll past. While it’s too soon for me to make a determination on which county I think would win a hypothetical Best Candy-Throwing from Floats to Spectators Award, I will say that Torrance County holds an early lead. It would be hard to beat the volume of bubble gum and lollipops flung through the air in Estancia on parade day. (Though other counties must try!) And after having once accidentally gotten between thrower and spectator in time to be barraged by a hail of Tootsie Rolls, I can personally attest that candy in Torrance County is thrown with the greatest sincerity. I love the fairgrounds themselves and the way they make us see things differently—even one another. You’re there with your family or friends, and as you’re checking out the pygmy goats and the lemonade stand in the shape of a lemon and amble over to the floriculture exhibit, even though you’re not really sure what floriculture is, you see a friend or coworker, and something wonderful happens. You just saw them yesterday at work or at school or in the grocery store. But now you’re seeing them here, at the fair—and that makes it better. Something is different … just like the quilt and the pickles and the flowers, your friend suddenly seems extraordinary, too. You shake hands or hug, make a joke about needing to get on the committee that judges the baked goods, and depart from the moment happier. I can’t think of anything more inclusive than the juried exhibits at a county fair. Every possible thing that can be grown or sewn or pickled has a category, class, and lot number awaiting it there. Whether you’re into jams or sauces, beaded cross-stitch or crochet, photography or decoupage or fused glass, they’ve been expecting you. To walk through the food exhibits is to be stimulated, again and again, by that instinct deep inside that draws us closer to the ways of the earth, deeper still to some sort of origin point where life is simple and pure and right. Melons and squashes with blue and yellow ribbons taped to their rinds, chile peppers and beets arranged on white paper plates, pumpkins, watermelons, cantaloupes, and other fruits of the harvest—and all their sweet, pungent smells turning the metal show barn into a Palace of Olfactory Delights. Some decadent things, too, to make your mouth water with temptation, like a Coca-Cola cake and peanut butter balls, or elderberry jam glistening in a Mason jar. And a radiant purple Best of Show ribbon taped to a strange vegetable thing that looks like some kind of gourd but you’re not sure what it is, reminding you that there are people who know a lot about things you can’t even name. But all the proof you need that fairs are the heart of our communities can be found in the show rings, where the events that are the most high-stakes and critical to the fair—the showing of animals and the Junior Livestock Auction—have been entrusted to young people. Months of work have gone into these events, the kids tending their animals before and after school since the start of the year, feeding them, training them to respond to a calm, guiding hand. When the time for judging arrives, the boys and girls lead their animals in the ring one class at a time, lambs, goats, hogs, and steers, driving them with determined hands and not putting up with any of their fussing. The lambs go ’round the ring, and the steers go ’round the ring, and the hogs go everywhere at once because they’re hogs. At last the judge makes a decision, first in class, second in class, and then the classes are brought together and shown, and the judge selects the grand champion and reserve champion, and the winning kids receive shiny silver-and-turquoise belt buckles, which are often as big as they are. And then, at last, the main event: the Junior Livestock Auction. This is what it all comes down to, all the kids’ hard work and preparation, the culmination of their practice and maturing instincts—a chance to prove that, yes, they’ve got this. Wearing the buckles they won the day before, the boys and girls again lead their animals into the ring, this time before an audience of potential buyers. The lambs go ’round, and the steers go ’round, and then the goats and the hogs, and in the bleachers, the bank president and the feed-store manager and the hardware-store owner gesture to make their bids. Bringing together seller and buyer, the bridge between have and want, is the sharp staccato patter of the auctioneer. It’s a complex song, more difficult than any pop ditty because the lyrics change every second, and when you hear its undulating rhythm surrounding the show ring like a swarm of late-summer mosquitos, you know that the auctioneer is hard at work. What you might not know, though, is that the auctioneer takes the success of these sales personally. He knows that it might be one of the most important financial events in a family’s year, and so he’s using his chant to encourage the buyers to action, driving the sale outside the ring just as surely as the kids are driving their animals inside it. There’s a sincerity in his art, too. And it’s working: The bids roll in, a couple hundred, a couple thousand, and the kids are nervous but it doesn’t show, and the buyers are probably a little nervous, too, but it doesn’t show, and the bids go up and up and up until at some point it’s no longer an animal being bid on but a way of life, a show of love and caring for a neighbor, a coming together from many to one. The hardware store doesn’t need a steer—they’ll donate the meat. What they’re bidding on is a community. Every dollar is a nod, a gentle hand on a shoulder during a hard time, an extra blanket kept ready just in case. And overhead the sky is blue and bold, and a mother sitting in the bleachers tells her children nearby not to play in the dirt, and two men in cowboy hats and checkered shirts standing ringside watch with their feet propped up on a rail, and the air smells of mud and hay and corn dogs. After the sale is done, I’ve seen the same boys and girls who so maturely led their animals in the ring moments before seek a quiet place away from the crowd where they can wipe the tears from their eyes. Although they tried hard not to let it happen, their animal had become a friend. Often a parent is consoling them, and I know that important lessons about life and loss and saying goodbye are being imparted. But I also know that if it were me in their place, I’d be crying too. Just like summer, fairs end quickly. The animals are taken, the art removed from pegboard partitions, the quilts and fancy work shawls folded and tucked away, the pens raked out by an overworked member of the Fair Board. The concessions are shut, the barn doors close, the show ring’s bunting comes down. And as the fairgoers leave the grounds, one person in every group declares that they’re going to enter the photography competition next year because they could win for sure. Then they get in their trucks and drive away, leaving the windows up because there’s a slight nip in the air. 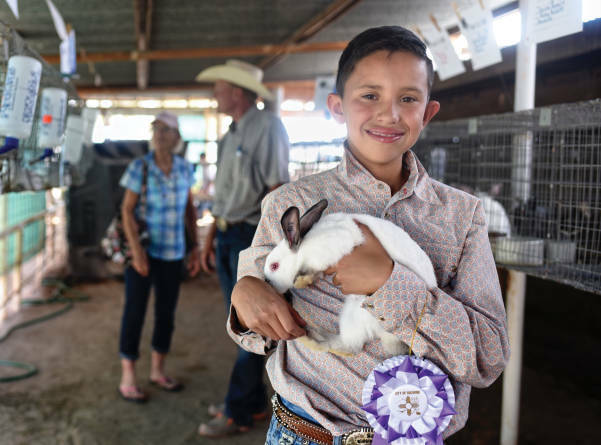 County fairs are as varied as the counties that host them and can include rodeos, western dances, chainsaw-cutting competitions, pet parades, and community barbecues, in addition to the exhibits and livestock shows. Find a schedule for the fairs, July 23–October 8, at aces.nmsu.edu/fairs. Computer-search a county’s name plus “fair book” to see each one’s events. Fairs generally run for several days and include a Saturday, which is often the day of the fair parade. Don’t leave once the parade is over! Stay for the awards ceremony, usually held at the end of the parade route, where you can cheer for your favorite float. Judging of indoor exhibits at the fairgrounds, including baked goods and art, is closed to the public but is done early in the week so that the exhibits can be admired for the remainder of the fair. Seeing lots of ribbons? When the competition is tight, some counties will award multiple winners within the same category. Animal-showing and judging events take place over several days. Small animals like rabbits are often judged at their pens, larger animals in the show ring. These events are great opportunities for learning the characteristics of award-winning animals and showmanship. Upon making their place selections, the judges, who are experts in that animal, will explain to the audience what they were looking for and how they chose the winners. The Junior Livestock Auction is one of the last events on the schedule. You don’t have to be a buyer to participate: You can make an add-on donation to any sale by alerting an assistant at the auction of the amount you’d like to contribute. That money will go directly to the seller.